Proprietary Name: Azelastine Hydrochloride What is the Proprietary Name? Non-Proprietary Name: Azelastine Hydrochloride What is the Non-Proprietary Name? 76519 - H.j. Harkins Company, Inc.
Azelastine Hydrochloride with NDC 76519-1222 is a a human prescription drug product labeled by H.j. Harkins Company, Inc.. The generic name of Azelastine Hydrochloride is azelastine hydrochloride. The product's dosage form is spray, metered and is administered via nasal form. Labeler Name: H.j. Harkins Company, Inc. Dosage Form: Spray, Metered - A non-pressurized dosage form consisting of valves which allow the dispensing of a specified quantity of spray upon each activation. FDA Application Number: ANDA090176 What is the FDA Application Number? Azelastine Hydrochloride Nasal Spray is indicated for the treatment of the symptoms of seasonal allergic rhinitis in adults and pediatric patients 5 years and older, and for the treatment of the symptoms of vasomotor rhinitis in adults and adolescent patients 12 years and older. 2.1 Seasonal Allergic RhinitisThe recommended dosage of Azelastine Hydrochloride Nasal Spray in adults and adolescent patients 12 years and older with seasonal allergic rhinitis is one or two sprays per nostril twice daily. The recommended dosage of Azelastine Hydrochloride Nasal Spray in pediatric patients 5 years to 11 years of age is one spray per nostril twice daily.2.2 Vasomotor RhinitisThe recommended dosage of Azelastine Hydrochloride Nasal Spray in adults and adolescent patients 12 years and older with vasomotor rhinitis is two sprays per nostril twice daily.2.3 Important Administration InstructionsAdminister Azelastine Hydrochloride Nasal Spray by the intranasal route only.Priming: Prime Azelastine Hydrochloride Nasal Spray before initial use by releasing 4 sprays or until a fine mist appears. When Azelastine Hydrochloride Nasal Spray has not been used for 3 or more days, reprime with 2 sprays or until a fine mist appears. Avoid spraying Azelastine Hydrochloride Nasal Spray into the eyes. Azelastine Hydrochloride Nasal Spray is a nasal spray solution. Each spray of Azelastine Hydrochloride Nasal Spray delivers a volume of 0.137 mL solution containing 137 mcg of azelastine hydrochloride. 5.1 Somnolence in Activities Requiring Mental AlertnessIn clinical trials, the occurrence of somnolence has been reported in some patients taking Azelastine Hydrochloride Nasal Spray [see ADVERSE REACTIONS (6.1)]. Patients should be cautioned against engaging in hazardous occupations requiring complete mental alertness and motor coordination such as operating machinery or driving a motor vehicle after administration of Azelastine Hydrochloride Nasal Spray. Concurrent use of Azelastine Hydrochloride Nasal Spray with alcohol or other central nervous system depressants should be avoided because additional reductions in alertness and additional impairment of central nervous system performance may occur [see DRUG INTERACTIONS (7.1)]. Bitter Taste42 (19.4%)5 (2.4%)Headache17 (7.9%)16 (7.6%)Dysesthesia17 (7.9%)7 (3.3%)Rhinitis12 (5.6%)5 (2.4%)Epistaxis7 (3.2%)5 (2.4%)Sinusitis7 (3.2%)4 (1.9%)Somnolence7 (3.2%)2 (1.0%)Reactions observed infrequently (<2% and exceeding placebo incidence) in patients who received Azelastine Hydrochloride Nasal Spray (2 sprays/nostril twice daily) in U.S. clinical trials in vasomotor rhinitis were similar to those observed in U.S. clinical trials in seasonal allergic rhinitis.In controlled trials involving nasal and oral azelastine hydrochloride formulations, there were infrequent occurrences of hepatic transaminase elevations.6.2 Postmarketing ExperienceDuring the post approval use of Azelastine Hydrochloride Nasal Spray, the following adverse reactions have been identified. Because these reactions are reported voluntarily from a population of uncertain size, it is not always possible to reliably estimate their frequency or establish a causal relationship to drug exposure. Adverse reactions reported include: anaphylaxis, application site irritation, atrial fibrillation, chest pain, confusion, dyspnea, facial edema, involuntary muscle contractions, nasal sores, palpitations, paresthesia, parosmia, pruritus, rash, disturbance or loss of sense of smell and/or taste, tolerance, urinary retention, vision abnormal and xerophthalmia. 7.1 Central Nervous System DepressantsConcurrent use of Azelastine Hydrochloride Nasal Spray with alcohol or other central nervous system depressants should be avoided because reductions in alertness and impairment of central nervous system performance may occur [see WARNINGS AND PRECAUTIONS (5.1)]. 8.1 PregnancyPregnancy Category C: There are no adequate and well-controlled clinical studies in pregnant women. Azelastine hydrochloride has been shown to cause developmental toxicity in mice, rats, and rabbits. Azelastine Hydrochloride Nasal Spray should be used during pregnancy only if the potential benefit justifies the potential risk to the fetus.Teratogenic Effects: In mice, azelastine hydrochloride caused embryo-fetal death, malformations (cleft palate; short or absent tail; fused, absent or branched ribs), delayed ossification, and decreased fetal weight at approximately 170 times the maximum recommended human daily intranasal dose (MRHDID) in adults (on a mg/m2 basis at a maternal oral dose of 68.6 mg/kg/day which also caused maternal toxicity as evidenced by decreased body weight). Neither fetal nor maternal effects occurred in mice at approximately 7 times the MRHDID in adults (on a mg/m2 basis at a maternal oral dose of 3 mg/kg/day).In rats, azelastine hydrochloride caused malformations (oligo- and brachydactylia), delayed ossification and skeletal variations, in the absence of maternal toxicity, at approximately 150 times the MRHDID in adults (on a mg/m2 basis at a maternal oral dose of 30 mg/kg/day). Azelastine hydrochloride caused embryo-fetal death and decreased fetal weight and severe maternal toxicity at approximately 340 times the MRHDID (on a mg/m2 basis at a maternal oral dose of 68.6 mg/kg/day). Neither fetal nor maternal effects occurred at approximately 15 times the MRHDID (on a mg/m2 basis at a maternal oral dose of 2 mg/kg/day).In rabbits, azelastine hydrochloride caused abortion, delayed ossification and decreased fetal weight and severe maternal toxicity at approximately 300 times the MRHDID in adults (on a mg/m2 basis at a maternal oral dose of 30 mg/kg/day). Neither fetal nor maternal effects occurred at approximately 3 times the MRHDID (on a mg/m2 basis at a maternal oral dose of 0.3 mg/kg/day).8.3 Nursing MothersIt is not known whether azelastine hydrochloride is excreted in human milk. Because many drugs are excreted in human milk, caution should be exercised when Azelastine Hydrochloride Nasal Spray is administered to a nursing woman.8.4 Pediatric UseThe safety and effectiveness of Azelastine Hydrochloride Nasal Spray for the treatment of symptoms of seasonal allergic rhinitis have been established for patients 5 years and older [see ADVERSE REACTIONS (6.1) and CLINICAL STUDIES (14.1)]. The safety and effectiveness of Azelastine Hydrochloride Nasal Spray for the treatment of vasomotor rhinitis have been established for patients 12 years and older [see ADVERSE REACTIONS (6.1) and CLINICAL STUDIES (14.2)]. The safety and effectiveness of Azelastine Hydrochloride Nasal Spray in pediatric patients below the age of 5 years with seasonal allergic rhinitis and in pediatric patients below the age of 12 years with vasomotor rhinitis have not been established.8.5 Geriatric UseClinical trials of Azelastine Hydrochloride Nasal Spray did not include sufficient numbers of patients aged 65 and over to determine whether they respond differently from younger patients. Other reported clinical experience has not identified differences in responses between the elderly and younger patients. In general, dose selection for an elderly patient should be cautious, usually starting at the low end of the dosing range, reflecting the greater frequency of decreased hepatic, renal, or cardiac function, and of concomitant disease or other drug therapy. There have been no reported overdosages with Azelastine Hydrochloride Nasal Spray. Acute overdosage by adults with this dosage form is unlikely to result in clinically significant adverse reactions, other than increased somnolence, since one bottle of Azelastine Hydrochloride Nasal Spray contains 30 mg of azelastine hydrochloride. Clinical trials in adults with single doses of the oral formulation of azelastine hydrochloride (up to 16 mg) have not resulted in increased incidence of serious adverse reactions. General supportive measures should be employed if overdosage occurs. There is no known antidote to Azelastine Hydrochloride Nasal Spray. Oral ingestion of antihistamines has the potential to cause serious adverse effects in young children. Accordingly, Azelastine Hydrochloride Nasal Spray should be kept out of the reach of children. Azelastine Hydrochloride Nasal Spray, 0.1% (137 micrograms (mcg) per spray), is an antihistamine formulated as a metered-spray solution for intranasal administration. Azelastine hydrochloride occurs as a white, almost odorless, crystalline powder with a bitter taste. It has a molecular weight of 418.37. It is sparingly soluble in water, methanol, and propylene glycol and slightly soluble in ethanol, octanol, and glycerine. It has a melting point of about 225°C and the pH of a saturated solution is between 5.0 and 5.4. 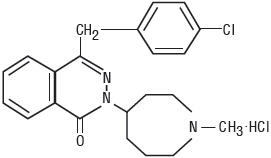 Its chemical name is (±)-1-(2H)-phthalazinone, 4-[(4-chlorophenyl) methyl]-2-(hexahydro-1-methyl-1H-azepin-4-yl)-, monohydrochloride. Its molecular formula is C22H24ClN3O∙HCl with the following chemical structure:Azelastine Hydrochloride Nasal Spray contains 0.1% azelastine hydrochloride in an aqueous solution at pH 6.8 ± 0.3. It also contains benzalkonium chloride (125 mcg/mL), edetate disodium, hypromellose, citric acid, dibasic sodium phosphate heptahydrate, sodium chloride, and purified water.After priming [see DOSAGE AND ADMINISTRATION (2.3)], each metered spray delivers a 0.137 mL mean volume containing 137 mcg of azelastine hydrochloride (equivalent to 125 mcg of azelastine base). The bottle can deliver 200 metered sprays. 12.1 Mechanism of ActionAzelastine hydrochloride, a phthalazinone derivative, exhibits histamine H1-receptor antagonist activity in isolated tissues, animal models, and humans. Azelastine Hydrochloride Nasal Spray is administered as a racemic mixture with no difference in pharmacologic activity noted between the enantiomers in in vitro studies. The major metabolite, desmethylazelastine, also possesses H1-receptor antagonist activity.12.2 PharmacodynamicsCardiac Electrophysiology:In a placebo-controlled study (95 subjects with allergic rhinitis), there was no evidence of an effect of Azelastine Hydrochloride Nasal Spray (2 sprays per nostril twice daily for 56 days) on cardiac repolarization as represented by the corrected QT interval (QTc) of the electrocardiogram. Following multiple dose oral administration of azelastine 4 mg or 8 mg twice daily, the mean change in QTc was 7.2 msec and 3.6 msec, respectively.Interaction studies investigating the cardiac repolarization effects of concomitantly administered oral azelastine hydrochloride and erythromycin or ketoconazole were conducted. These drugs had no effect on QTc based on analysis of serial electrocardiograms. At a dose approximately 8 times the maximum recommended dose, azelastine hydrochloride does not prolong the QTc interval to any clinically relevant extent.12.3 PharmacokineticsAbsorption: After intranasal administration, the systemic bioavailability of azelastine hydrochloride is approximately 40%. Maximum plasma concentrations (Cmax) are achieved in 2-3 hours.Azelastine hydrochloride administered intranasally at doses above two sprays per nostril twice daily for 29 days resulted in greater than proportional increases in Cmax and area under the curve (AUC) for azelastine.Distribution: Based on intravenous and oral administration, the steady-state volume of distribution is 14.5 L/kg. In vitro studies with human plasma indicate that the plasma protein binding of azelastine and its metabolite, desmethylazelastine, are approximately 88% and 97%, respectively.Metabolism: Azelastine is oxidatively metabolized to the principal active metabolite, desmethylazelastine, by the cytochrome P450 enzyme system. The specific P450 isoforms responsible for the biotransformation of azelastine have not been identified. After intranasal dosing of azelastine hydrochloride to steady-state, plasma concentrations of desmethylazelastine range from 20-50% of azelastine concentrations. Limited data indicate that the metabolite profile is similar when azelastine hydrochloride is administered via the intranasal or oral route.Elimination: Based on intravenous and oral administration, the elimination half-life and plasma clearance are 22 hours and 0.5 L/h/kg, respectively. Approximately 75% of an oral dose of radiolabeled azelastine hydrochloride was excreted in the feces with less than 10% as unchanged azelastine.Special Populations:Hepatic Impairment: Following oral administration, pharmacokinetic parameters were not influenced by hepatic impairment.Renal Impairment: Based on oral, single-dose studies, renal insufficiency (creatinine clearance <50 mL/min) resulted in a 70-75% higher Cmax and AUC compared to normal subjects. Time to maximum concentration was unchanged.Age: Following oral administration, pharmacokinetic parameters were not influenced by age.Gender: Following oral administration, pharmacokinetic parameters were not influenced by gender.Race: The effect of race has not been evaluated.Drug-Drug Interactions:Erythromycin: No significant pharmacokinetic interaction was observed with the co-administration of orally administered azelastine (4 mg twice daily) with erythromycin (500 mg three times daily for 7 days). In this study, co-administration of orally administered azelastine with erythromycin resulted in Cmax of 5.36 ± 2.6 ng/mL and AUC of 49.7 ± 24 ng∙h/mL for azelastine, whereas, administration of azelastine alone resulted in Cmax of 5.57 ± 2.7 ng/mL and AUC of 48.4 ± 24 ng∙h/mL for azelastine.Cimetidine and Ranitidine: In a multiple-dose, steady-state drug interaction trial in healthy subjects, cimetidine (400 mg twice daily) increased orally administered mean azelastine (4 mg twice daily) concentrations by approximately 65%. No pharmacokinetic interaction was observed with co-administration of orally administered azelastine (4 mg twice daily) with ranitidine hydrochloride (150 mg twice daily). Oral co-administration of azelastine with ranitidine resulted in Cmax of 8.89 ±3.28 ng/mL and AUC of 88.22 ± 40.43 ng∙h/mL for azelastine, whereas, azelastine when administered alone resulted in Cmax of 7.83 ± 4.06 ng/mL and AUC of 80.09 ± 43.55 ng∙h/mL for azelastine.Theophylline: No significant pharmacokinetic interaction was observed with the co-administration of an oral 4 mg dose of azelastine hydrochloride twice daily and theophylline 300 mg or 400 mg twice daily. 13.1 Carcinogenesis, Mutagenesis, Impairment of FertilityIn 2-year carcinogenicity studies in rats and mice, azelastine hydrochloride did not show evidence of carcinogenicity at oral doses up to 30 mg/kg and 25 mg/kg, respectively. These doses were approximately 150 and 60 times the maximum recommended human daily intranasal dose [MRHDID] on a mg/m2 basis.Azelastine hydrochloride showed no genotoxic effects in the Ames test, DNA repair test, mouse lymphoma forward mutation assay, mouse micronucleus test, or chromosomal aberration test in rat bone marrow.Reproduction and fertility studies in rats showed no effects on male or female fertility at oral doses up to 30 mg/kg (approximately 150 times the MRHDID in adults on a mg/m2 basis). At 68.6 mg/kg (approximately 340 times the MRHDID on a mg/m2 basis), the duration of estrous cycles was prolonged and copulatory activity and the number of pregnancies were decreased. The numbers of corpora lutea and implantations were decreased; however, pre-implantation loss was not increased. Treatment DifferenceP-valueTrial 4: 12 Hour AM and PM Reflective TNSSAzelastine Hydrochloride Nasal Spray13816.34 (4.22)-2.69 (4.79)1.380.01Placebo Nasal Spray14117.21 (4.32)-1.31 (4.29)Trial 5: 12 Hour AM and PM Reflective TNSSAzelastine Hydrochloride Nasal Spray13716.62 (4.20)-3.68 (4.16)1.180.02Placebo Nasal Spray13616.84 (4.77)-2.50 (4.01)*Total Nasal Symptom Score (TNSS): Average of individual symptoms of runny nose, sneezing, itchy nose, and nasal congestion as assessed by patients on a 0-3 categorical scale.Two-week studies comparing the efficacy (and safety) of Azelastine Hydrochloride Nasal Spray two sprays per nostril twice daily versus one spray per nostril twice daily were not conducted.14.2 Vasomotor RhinitisThe efficacy and safety of Azelastine Hydrochloride Nasal Spray were evaluated in two placebo-controlled clinical trials of Azelastine Hydrochloride Nasal Spray including 216 patients with vasomotor rhinitis who received two sprays per nostril twice a day for up to 4 weeks. These patients had vasomotor rhinitis for at least one year, negative skin tests to indoor and outdoor aeroallergens, negative nasal smears for eosinophils, and negative sinus X-rays. Azelastine Hydrochloride Nasal Spray demonstrated a significantly greater decrease in a symptom complex comprised of rhinorrhea, post nasal drip, nasal congestion, and sneezing compared to placebo. Azelastine Hydrochloride Nasal Spray, 0.1% (137 mcg/spray) is supplied as a 30-mL package delivering 200 metered sprays in a high-density polyethylene (HDPE) bottle fitted with a metered-dose spray pump unit. The spray pump unit consists of a nasal spray pump fitted with a white safety clip and a white plastic dust cover. The net content of the bottle is 30 mL (net weight 30 gm of solution). Each bottle contains 30 mg (1 mg/mL) of azelastine hydrochloride. After priming [see DOSAGE AND ADMINISTRATION (2.3)], each spray delivers a fine mist containing a mean volume of 0.137 mL solution containing 137 mcg of azelastine hydrochloride. The correct amount of medication in each spray cannot be assured before the initial priming and after 200 sprays have been used, even though the bottle is not completely empty. The bottle should be discarded after 200 sprays have been used. 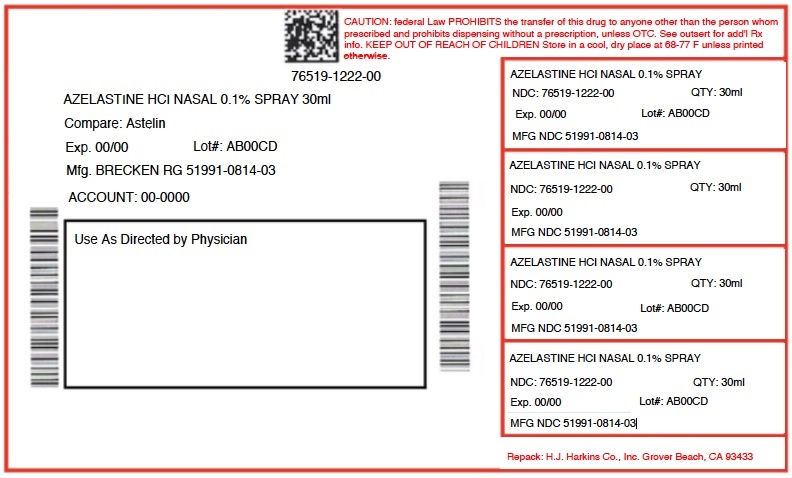 Azelastine Hydrochloride Nasal Spray should not be used after the expiration date "EXP" printed on the medicine label and carton. See FDA-approved patient labeling (PATIENT INFORMATION and INSTRUCTIONS FOR USE).Activities Requiring Mental AlertnessSomnolence has been reported in some patients taking Azelastine Hydrochloride Nasal Spray. Caution patients against engaging in hazardous occupations requiring complete mental alertness and motor coordination such as driving or operating machinery after administration of Azelastine Hydrochloride Nasal Spray [see WARNINGS AND PRECAUTIONS (5.1)].Concurrent Use of Alcohol and other Central Nervous System DepressantsInstruct patients to avoid concurrent use of Azelastine Hydrochloride Nasal Spray with alcohol or other central nervous system depressants because additional reductions in alertness and additional impairment of central nervous system performance may occur [see WARNINGS AND PRECAUTIONS (5.1)].Common Adverse ReactionsInform patients that the treatment with Azelastine Hydrochloride Nasal Spray may lead to adverse reactions, which include bitter taste, headache, somnolence, dysesthesia, rhinitis, nasal burning, pharyngitis, epistaxis, sinusitis, paroxysmal sneezing, nausea, dry mouth, fatigue, dizziness, and weight increase [see ADVERSE REACTIONS (6.1)].PrimingInstruct patients to prime the pump before initial use and when Azelastine Hydrochloride Nasal Spray has not been used for 3 or more days [see DOSAGE AND ADMINISTRATION (2.3)].Keep Spray Out of EyesInstruct patients to avoid spraying Azelastine Hydrochloride Nasal Spray into their eyes.Keep Out of Children's ReachInstruct patients to keep Azelastine Hydrochloride Nasal Spray out of the reach of children. If a child accidentally ingests Azelastine Hydrochloride Nasal Spray, seek medical help or call a poison control center immediately. Azelastine Hydrochloride Nasal SprayImportant: For use in your nose only.What is Azelastine Hydrochloride Nasal Spray?Azelastine Hydrochloride Nasal Spray is a prescription medicine used to treat symptoms of seasonal allergic rhinitis in people age 5 and older and vasomotor rhinitis in people age 12 and older. Azelastine Hydrochloride Nasal Spray may help to reduce your nasal symptoms including stuffy nose, runny nose, itching and sneezing. It is not known if Azelastine Hydrochloride Nasal Spray is safe and effective in children with seasonal allergic rhinitis under 5 years of age or in children with vasomotor rhinitis under 12 years of age.What should I tell my healthcare provider before using Azelastine Hydrochloride Nasal Spray?Before using Azelastine Hydrochloride Nasal Spray, tell your healthcare provider if you are:allergic to any of the ingredients in Azelastine Hydrochloride Nasal Spray. See the end of this leaflet for a complete list of ingredients in Azelastine Hydrochloride Nasal Spray. pregnant, or plan to become pregnant. It is not known if Azelastine Hydrochloride Nasal Spray will harm your unborn baby. breastfeeding, or plan to breastfeed. It is not known if azelastine hydrochloride passes into your breast milk. You and your healthcare provider should decide if you will use Azelastine Hydrochloride Nasal Spray if you plan to breastfeed. Tell your healthcare provider about all the medicines you take, including prescription and over-the-counter medicines, vitamins, and herbal supplements. Azelastine Hydrochloride Nasal Spray and other medicines may affect each other, causing side effects.How should I use Azelastine Hydrochloride Nasal Spray?Read the Instructions for Use at the end of this leaflet for information about the right way to use Azelastine Hydrochloride Nasal Spray. Spray Azelastine Hydrochloride Nasal Spray in your nose only. Do not spray it into your eyes or mouth. Use Azelastine Hydrochloride Nasal Spray exactly as your healthcare provider tells you to use it. Throw away your Azelastine Hydrochloride Nasal Spray bottle after using 200 sprays. Even though the bottle may not be completely empty, you may not get the correct dose of medicine. If you use too much or a child accidentally swallows Azelastine Hydrochloride Nasal Spray, call your healthcare provider or go to the nearest hospital emergency room right away. What should I avoid while using Azelastine Hydrochloride Nasal Spray?Azelastine Hydrochloride Nasal Spray can cause sleepiness:Do not drive, operate machinery, or do other dangerous activities until you know how Azelastine Hydrochloride Nasal Spray affects you. Do not drink alcohol or take other medicines that may cause you to feel sleepy while using Azelastine Hydrochloride Nasal Spray. It may make your sleepiness worse. Tell your healthcare provider if you have any side effect that bothers you or that does not go away.These are not all of the possible side effects of Azelastine Hydrochloride Nasal Spray. For more information, ask your healthcare provider or pharmacist.Call your doctor for medical advice about side effects. You may report side effects to FDA at 1-800-FDA-1088.How should I store Azelastine Hydrochloride Nasal Spray?Keep Azelastine Hydrochloride Nasal Spray upright at 68°F to 77°F (20°C to 25°C). Do not freeze Azelastine Hydrochloride Nasal Spray. Do not use Azelastine Hydrochloride Nasal Spray after the expiration date "EXP" on the medicine label and box. Keep Azelastine Hydrochloride Nasal Spray and all medicines out of reach of children.General information about the safe and effective use of Azelastine Hydrochloride Nasal Spray.Medicines are sometimes prescribed for conditions other than those listed in a Patient Information leaflet. Do not use Azelastine Hydrochloride Nasal Spray for a condition for which it was not prescribed. Do not give Azelastine Hydrochloride Nasal Spray to other people, even if they have the same symptoms that you have. It may harm them.This Patient Information leaflet summarizes the most important information about Azelastine Hydrochloride Nasal Spray. If you would like more information, talk with your healthcare provider. You can ask your pharmacist or healthcare provider for information about Azelastine Hydrochloride Nasal Spray that is written for health professionals.For more information go to www.bpirx.com or call 1-800-367-3395.What are the ingredients in Azelastine Hydrochloride Nasal Spray?Active ingredient: azelastine hydrochlorideInactive ingredients: benzalkonium chloride, edetate disodium, hypromellose, citric acid, dibasic sodium phosphate heptahydrate, sodium chloride, and purified water. Azelastine Hydrochloride Nasal SprayImportant: For use in your nose only.For the correct dose of medicine:Keep your head tilted downward when spraying into your nostril. Hold the bottle upright with 2 fingers on the shoulders of the spray pump unit andput your thumb on the bottom of the bottle. Press upward with your thumb and release for the pumping action. Repeat this until you see a fine mist (See FIGURE C). This should happen in 4 sprays or less. Do not use Azelastine Hydrochloride Nasal Spray unless you see a fine mist after you do the priming sprays. If you do not see a fine mist, clean the tip of the spray nozzle. 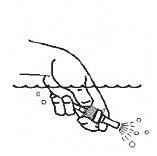 See the "CLEANING THE SPRAY TIP OF YOUR AZELASTINE HYDROCHLORIDE NASAL SPRAY" section below. If you do not use Azelastine Hydrochloride Nasal Spray for 3 or more days, you will need to prime the pump with 2 sprays or until you see a fine mist. Step 5. Repeat Step 3 and Step 4 in your other nostril.Step 6. 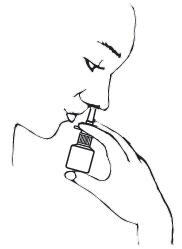 If your healthcare provider tells you to use 2 sprays in each nostril, repeat Steps 2 through 4 above for the second spray in each nostril.Step 7. Breathe in gently, and do not tilt your head back after using Azelastine Hydrochloride Nasal Spray. This will help to keep the medicine from going into your throat.Step 8. When you finish using your Azelastine Hydrochloride Nasal Spray, wipe the spray tip with a clean tissue or cloth. 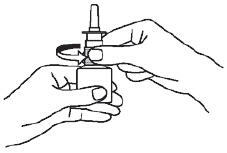 Put the safety clip and dust cover back on the bottle.Cleaning the Spray Tip of your Azelastine Hydrochloride Nasal SprayIf the spray tip opening is clogged, do not use a pin or pointed object to unclog the tip. 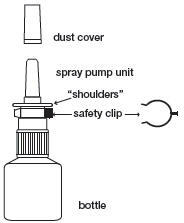 Unscrew the spray pump unit from the bottle by turning it to the left (counter-clockwise) (See FIGURE F).